GSNW Contest: Win a Taste! In Season: Ramp It Up! Livin' in the Blurbs: Spring Has Sprung! So Thaaaaaat's Where It Comes From! William Wegman, Weimaraner-photographer extraordinaire, did several video segments for Sesame Street in the 90s. This is a classic starring the extraordinary Fay Ray's offspring, Chundo and Crooky, and her grandson, Chip. For more, click here. Because this blog is all about news you can really use, versus the stuff that passes for information on the front page of, say, the New York Times or the twaddle that takes up airtime on NPR, for those who need to know more about the burning issues of our time I've got a couple of hot scoops to pass on. Or at least a couple of blog posts that piqued my interest this morning. A couple of Mark Bittman's pals have contributed posts about ramps, one by Daniel Meyer titled "Ramping Up for Spring" that has several delicious-sounding ideas for using this wild member of the leek family, and a lovely essay touting the same vegetable's spring debut by veteran Edward Schneider, "An Old Hand's View of Ramps." For those who can't get enough, there's also a post from Ed from last year. And a question for those in the know: I've heard rumors of ramps being found right here in the Northwest, though our area doesn't appear on any maps I've seen of the plant's habitat. Does anyone know if this is true? Curious (and hungry) readers want to know! Photo at top by Daniel Meyer; photo on left by Edward Schneider, both for Bitten. Cutting, slicing and slashing are words commonly used to describe decreasing the price of a product. But the beef industry of late has been intent on cutting and slicing to increase the prices you pay at the meat counter. 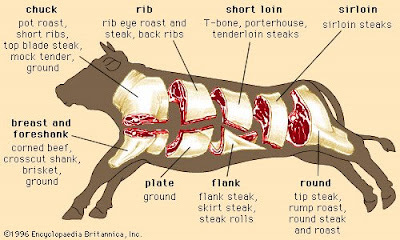 As reported in the New York Times article "Same Cow, No Matter How You Slice It," writer Kim Severson describes a recent effort on the part of the National Cattlemen's Beef Association to "dig around in the carcass and find muscles that, when separated and sliced in a certain way, were tender and tasty enough to be sold as a steak or a roast." The study, costing $1.5 million and taking five years to complete, basically took traditionally cheap cuts of meat and, by cutting them differently and renaming them, justified an increase in their price. 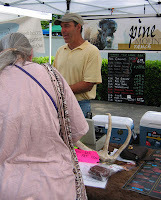 Tom Mylan, a Brooklyn butcher, said, "The difference in a good name is worth $3 or $4 a pound." One example is the newly named "Denver steak" that, instead of being ground into hamburger and sold for $2.99 a pound, can be cooked like a steak and sold for $5.99 a pound. Traditional butchers are pooh-poohing this marketing ploy, saying European and American butchers have known about these cuts forever. One butcher said, "This is just a glorified chuck steak that they cleaned the junk off of." 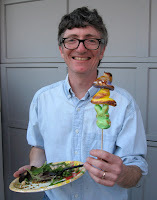 A "meat scientist" in Nebraska ("Hi Mom! Hi Dad! Guess what I've decided to be? A meat scientist! "), one Chris Calkins, is quoted as saying, no doubt in his most chipper voice, "If we can dig out a muscle and use it in a new way that hasn't been done before, it seems to me we are obligated to give that muscle an identity so someone can understand what it is." It's time to shake out your string bags and dust off the baskets, because the market season is getting started in earnest this month. It'll be a big weekend in Northeast Portland with the Hollywood Farmers' Market kicking off its 13th season this Saturday, and then on Sunday it's the debut of the King Farmers' Market, the brand-new baby in the Portland Farmers' Market clan that's kicking off with 45 vendors its first day. Also on Sunday the Hillsdale Farmers' Market reappears in its weekly incarnation and is, in my humble opinion, the best market in the city. Hollywood Farmers' Market, Saturdays, 8 am-1 pm; NE Hancock between 44th and 45th. 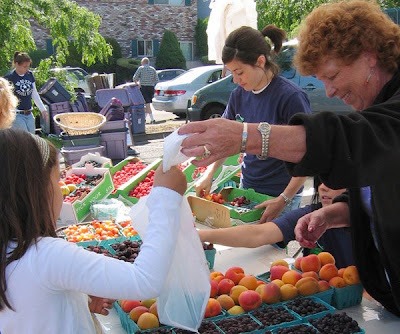 King Farmers' Market, Sundays, 10 am-2 pm; NE 7th and Wygant between NE Alberta and Prescott St.
Hillsdale Farmers' Market, 10 am-2 pm; At the intersection of SW Sunset Blvd. and SW Capitol Hwy. Like finding a penny on the sidewalk (and, by the way, I don't buy the face-up is good, face-down is bad addendum), it looks like my garden luck has turned. Not that last spring's cold and damp was my fault, by any stretch, but there are signs that this year may be very, very good for our dinner table. 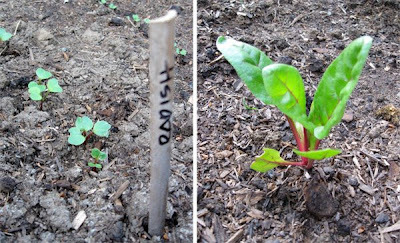 Going down the planting list, the carrots haven't poked up yet, but the radishes, arugula and mesclun are all popping up, and it looks like the volunteer chard from last year has survived after a bit of an early scare. No snap peas yet, but the rhubarb is unfurling several new leaves. And those other grand plans? Well, you'll be pleased that I've got two bids from landscapers to remove the parking strip tree that's heaving up the sidewalk and shading my beds, not to mention taking up valuable south-facing soon-to-be tomato beds. Now I'm waiting for the city to approve a permit and it (and the arbor vitae hedge) will be history! "Okay, I’ll say it: This place is adorable. It’s really a waffle Dutch door—a bright blue one in the red brick wall of longtime Portland restaurant Bread and Ink, which opened the waffle shop in 2007. The Liège-style waffles come plain or with creative topping combinations, and the Three Bs (pepper bacon, Brie, and basil, with a spoonful of homemade peach jam; $4) is a crowd favorite. I’m more partial to the scoop of quivering lemon panna cotta with a thick drizzle of huckleberry jam and whipped cream ($4). They’ve set aside a small seating area inside the restaurant for rainy-day waffle eaters." All I can say to Gourmet is, "What took you so long?" 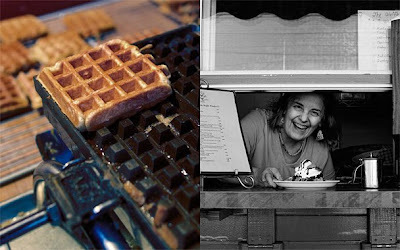 Details: Waffle Window, 3610 SE Hawthorne Blvd. Phone 503-239-4756. * Optional depending on the heat of the chile used. Be conservative. There is a debate among foodistas over the authenticity of Portland's pho, the long-simmered, delicate yet intensely flavored soup of Vietnam. Usually served with vermicelli, rice or egg noodles in a large bowl, it can contain any combination of meat parts (flank, brisket, chicken, tripe, pork blood, you name it) and comes with a platter of seasonings meant to be incorporated in the soup. 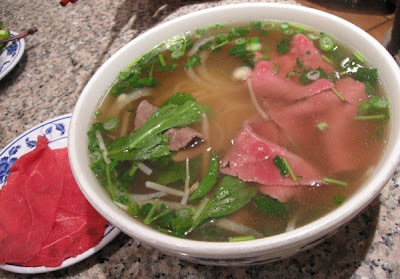 But the key to great pho is the broth, and many a Vietnamese cook has staked his or her reputation on the quality and nuance of their particular version. Not being an aficionado of the preparation, all I know is that nothing tastes better when you've got a cold or just need warming up or, indeed, if you simply want an inexpensive solution for lunch or dinner. The combination of cinnamon sticks, cloves, coriander pods, fennel seeds, star anise and cardamom wafts up from the bowl, and suddenly the universe feels like a calmer, more sensible place. Noodles with vegetables and meat skewers (Bun Tom Thit Nurong). Our favorite used to be a place on Fremont, but, as often happens, when it changed hands the quality wasn't the same. Fortunately we were introduced to Pho Oregon on NE 82nd and it has become our default when we need a pho fix. 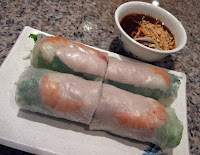 I've also grown fond of some of their non-pho offerings, particularly the Bun Tom Thit Nurong or vermicelli noodles with char-grilled skewers of shrimp, pork and vegetable, a hearty combination of vegetables and meats that, when the little bowl of dressing is poured over it, becomes like a warm Asian pasta salad. Curried Coconut Noodle Soup with Chicken (Bun Ga Ca Ri). Something I'm going to order soon is the bowl of curried coconut milk soup with chicken called Bun Ga Ca Ri. 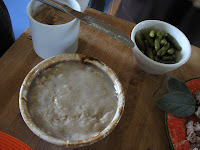 I had a taste of it recently and the slightly sweet, milky broth that infused the vegetables and meat was heavenly. And if you can get your table-mates to share some of the saw-leaf herb called ngo gai that comes with their pho, you'll feel like singing the Hallelujah Chorus. Details: Pho Oregon, 2518 NE 82nd Ave. 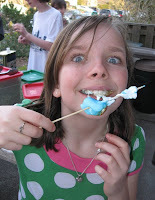 Phone 503-262-8816. Taste of the Nation is coming this Monday, April 27, and GoodStuffNW readers have a chance to win a pair of free tickets to the event. If you don't know about it, it's a yearly event sponsored by Share Our Strength that benefits hunger relief agencies right here in Oregon. The fun part is that you'll get to attend this gala evening that gathers 50 of Portland’s best restaurants, wineries, breweries and mixologists for a night of sampling and browsing the aisles. Some of the participants will be Paley's Place, The Country Cat, Firehouse, Andina, Baker & Spice, East India Company, DOC and FlavourSpot. Guests will enjoy the city’s finest foods paired with wines provided by Carabella Winery, Elk Cove Vineyard, Foris Winery and Argyle Winery, as well as offerings from SakeOne, Full Sail Brewing Co, Sierra Nevada Brewing Co., Aviation Gin, Finlandia Vodka and coffee from Caffe Umbria. All you have to do is e-mail me before noon on Sunday, April 26. I'll put all the names into a hat, draw the winner at 12:01 and let you know by e-mail how to pick up your tickets. Good luck! Details: Taste of the Nation at LUXE Autohaus, 410 NE 17th Ave. 6:30pm. General admission tickets, should you wish to purchase them, are $75; call 1-877-26TASTE or purchase tickets online. kaz is the lucky winner of the Taste of the Nation tickets and will be attending this wonderful event courtesy of GoodStuffNW. Congratulations, kaz! Let us know what you thought! I guess it's because I'm lacking that particular floaty toy in my Irish-Scottish-Alsatian-Austrian-Native American gene pool, but I've never really been attracted to the Italian penchant for combining pasta with beans. But this very tempting-sounding recipe from contributor Jim Dixon of Real Good Food has piqued my curiousity to do some culinary exploring. The red beans in this recipe are grown by Haricot Farms in Quincy, Washington (near Yakima), and are certified sustainable by the Food Alliance. They’re fresher than the average supermarket bean and have great flavor. I cook them using my no-soak, slow-cook approach. And ever since seeing a quote from a grizzled Tuscan (they are known as mangiafagiole or bean eaters, after all) to the effect that “beans cooked in a metal pot aren’t worth eating,” I’ve used a garage sale ceramic bean pot. I fill it about a third full, add a good pinch of sea salt, a healthy glug of extra virgin olive oil, and fill it most of the way up with water. A few hours in a 250° oven and they’re usually tender, though sometimes I need to add a little more water. 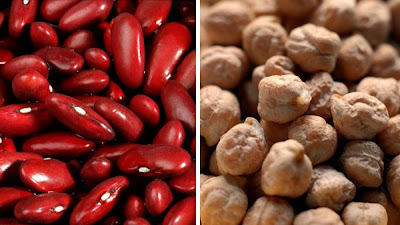 Add the cooked beans to soup, use them for composed salads, or eat them plain, drizzled with more extra virgin olive oil. Try a bowl topped with a poached or fried egg for breakfast. Cook a bunch of rapini (aka broccoli raab) in plenty of well-salted boiling water for about 5 minutes. Drain, let cool a little and chop coarsely. Chop a few garlic cloves and cook briefly in extra virgin olive oil. Add the chopped rapini, about a cup and half of cooked garbanzos (ceci in Italian), and a half cup or so of the garbanzo cooking liquid. Have a pot of water boiling so you can drop in a pound of good pasta at about the same time. An extruded shape, rather than a long noodle, works better for this, and I like to use 100% semolina Italian pasta. Cook the rapini and ceci for about 10 minutes, or until the pasta is done. Use a slotted spoon to transfer the pasta to the pan with the rapini, add a quarter cup or so of pasta water, and cook together for a few minutes. 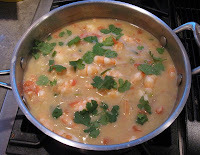 Serve with grated Parmigiano Reggiano. They're in season but, sadly, not around here. The habitat for Allium tricoccum, commonly known as ramps, is pretty much relegated to the eastern half of the US (see map below). But fortunately for us, several restaurants in the area will be including them on the menu in the next month or so. Our friends Bruce and Mary Fishback at Bread & Ink Cafe love this odd member of the onion family and bring in some every year to feature as specials. 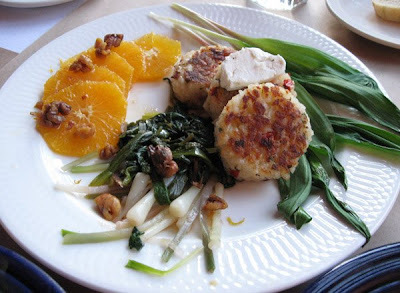 We joined them for dinner the other night and got to try several dishes, starting with the sautéed ramps salad with ricotta cakes and orange (top photo). The cooked ramps were tender and tasted much like sauteed green onions, and I asked Bruce why ramps have the reputation of being strong-flavored and stinky when these clearly were not. 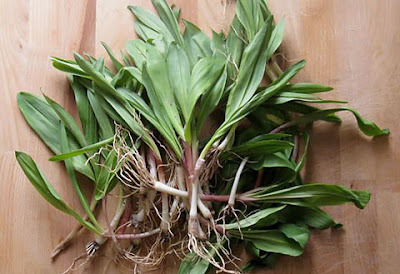 His conjecture was that ramps can become more strongly flavored as they mature and these, being about as slender as cooked spaghetti, were extremely young and tender. This was proven by the several strands of raw ramps on the side which were lovely when sliced and eaten with the ricotta cakes, orange and chevre. 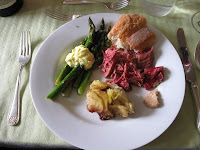 The ramps with asparagus and prosciutto on polenta (right) was the essence of spring, the ramps lending a lightly garlic-and-onion backdrop to the crisp green spears of asparagus. The other entree, ramps with spaghetti, wasn't listed on the menu but was basically pangrattato tossed with sauteed ramps, a simple and delicious way to enjoy these unusual harbingers of spring. Ramps are also being featured on the café's breakfast menu, but you'll need to get in soon or, like spring itself, they'll be gone before you know it. Sometimes there's a pony or a shiny bike under the Christmas tree, and sometimes you get socks instead. Expectations are like that and, as hard as I try to cultivate that "que sera sera" attitude, the fact that last year our tomato plants looked like survivors of a nuclear blast (and produced about as well) was, frankly, a big disappointment. The rest of the story is that the hedge of arbor vitae (on right in photo at left) that has screened our back yard "dining room" is going to be torn out with plans to replace it with an espaliered black mission fig. And the ash tree in the parking strip that is buckling the sidewalk and, worst of all, shading the boxes for a few hours a day, is going to come out this year. 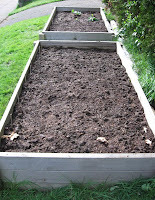 I'm hoping to do (mercifully short) weekly reports on the progress of all these grand schemes, and I'd love to know what you're up to in your gardens this year in your part of the world. So let's start talking! Summer around here means sitting under the tree in our back yard, sipping a cocktail and watching the sun as it dips behind the neighbors' houses. If we're lucky there's some cheese left over from a weekend dinner with friends that most definitely needs to be eaten, or some chips with a bit of salsa that was lingering in the back of the fridge. And there's no better place to get ideas for those cocktails than "borrowing" (such a kinder, gentler word than "stealing") them from the happy hour menus at our local watering holes. I was invited to a press preview of what will be cooling down patrons of the bar at the Pearl's 50 Plates, and the summer looks to be well-chilled if the items we sampled are any indication. The grapefruit cooler (top left) that was served up by Lance Mayhew, head mixologist, was a refreshingly bitter combination of vodka, grapefruit juice, tonic and Aperol, a rhubarb-based Italian aperitif that I'll be adding to our liquor cabinet very soon. Next up was a spiced lemon drop (top center), a well-balanced version of this popular happy hour workhorse, the "spice" coming from the Chinese five-spice powder that Mayhew had mixed with the extra-fine sugar coating the rim. The most interesting of the bunch was a blueberry cooler (top right) made with Jim Beam, blueberry juice and an unusual brown sugar simple syrup, with a complex mix of balancing agents like cinnamon, vanilla, cognac and lemon juice. This one might be a little too complicated to work on at home, but if you feel motivated definitely let me know. Or invite me over! The rest of the tasting focused on a series of "floats" the restaurant's been working on. The one I tasted featured coffee, kahlua and coffee ice cream, and Mayhew promised there were others in the works as well. He also said they've doubled their food offerings at happy hour, with ribs, a variety of sliders (called "sammies") and crostini added to the existing menu. To keep traffic in the restaurant moving, they'll also be doubling their hours, adding a late happy hour from 9 till midnight weekdays and 10 till closing on weekends. Details: 50 Plates, 333 NW 13th Ave. 503-228-5050. 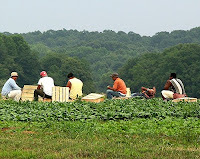 Think about this: What do you really know about the lives of the people who grow and harvest our food? Have you ever wondered where they live? Or looked into their eyes? As part of their series titled "The People Who Feed Us," Slow Food Portland and the Farmworker Housing Development Corporation are hosting an event where you'll meet local immigrant farmworker families, join them in conversation, learn about their lives and share a potluck lunch. You'll start the day with a light breakfast, and I guarantee you'll come away from lunch with a changed perspective. 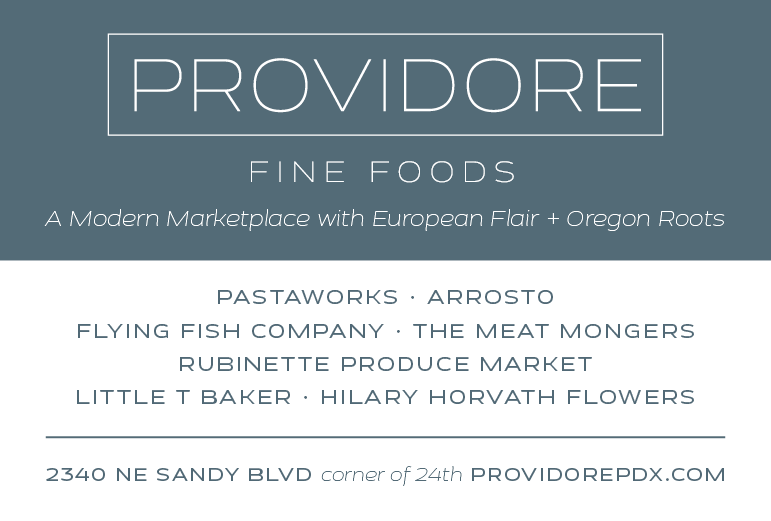 Details: The People Who Feed Us sponsored by Slow Food Portland and the Farmworker Housing Development Corporation. Sat., May 2, 8:30 am-1:30 pm, meet in Woodburn at FHDC community center, 1274 Fifth Street 1-A,Woodburn; $8, tickets available online. Love Indian food but think it's way too complicated to make at home? 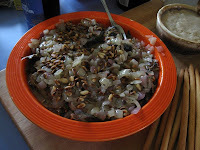 Or want to learn how to toast spices and sauté your onions like a pro? 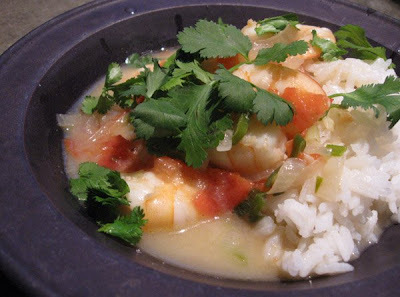 Then you need to take Sophie Rahman's upcoming two-part class on this deeply intriguing cuisine. 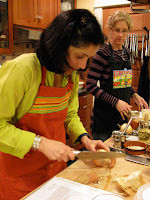 From my experience in her classes, you'll not only gain hands-on practice with ingredients and recipes, but learn new techniques and get an overview of the culinary history of the various regions. This is not to be missed! Details: Indian Cooking Classes with Sophie Rahman. Tues., May 5 and Tues., May 12, 6-9 pm; $70 for both classes. Reserve your place by e-mail or call 503 233-1966. If you're like me and wish you could climb over people's fences and get a better look at their gardens, the upcoming tour of the gardens of Portland's Raleigh Park neighborhood should scratch your itch. These sprawling suburban lots teem with wannabe landscape professionals who thrive on outdoing their neighbors, so this is a signal opportunity to get great ideas and do good at the same time. 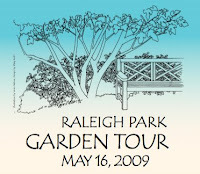 Details: Raleigh Park Garden Tour to benefit Raleigh Park Elementary School and West Slope Community Library gardens. 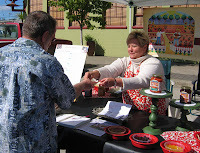 May 16, 10 am-3 pm; $17, tickets available by calling 503-292-5170. What is it about eggs that has me all up-ons these days? Whether raw on beef tartare, mixed with hot bacon and pasta, scrambled almost before it leaves the chicken, poached or deviled, there is something about their ovoid perfection that rings my chimes. Maybe it's the prize-inside-the-Cracker Jacks promise of the creamy, fatty yolk hidden inside its high-protein white jacket. Or its infinite variability. But when company's coming over, I take advantage of the opportunity to make one of my favorite appetizers ever. 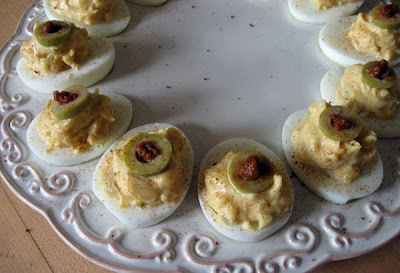 And, believe me, I've never had a guest say they only eat deviled eggs at summer picnics. These babies will disappear in wink and be replaced by contented smiles. 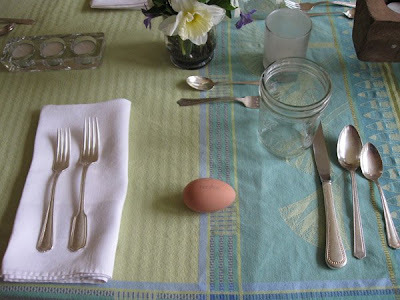 Halve eggs, putting yolks in small mixing bowl and placing whites on serving tray. Using long-tined fork, crush yolks until thoroughly mashed. Add anchovy fillets and mash into yolks. Chop six of the olives finely and add, with mayonnaise and pinch of paprika, to egg yolk mixture. Mix thoroughly. Fill whites with egg mixture and arrange on platter. 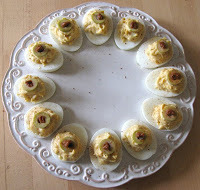 Slice each remaining olive into four rounds and top each egg with one, then put a small bit of the harissa on top of the olive. 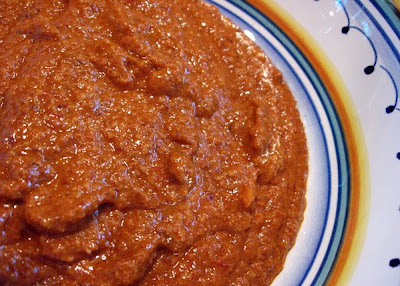 Put another pinch of smoked paprika into small mesh sieve and, tapping lightly, sprinkle platter with paprika. Serve. Brian's fried and marinated smelt. In any case, the kind offer was made by Brian and Clare, the hard-working stewards of Big Table Farm, to come out to their 70-acre spread in Williams canyon near Gaston. 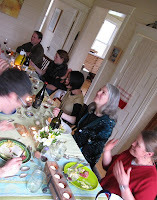 The occasion was Easter dinner and a tour of their property and critters, which to me is the equivalent of having Christmas, a trip to Paris and a litter of puppies magically fall in my lap on the same day. Though Dave had come down with an unfortunately timed head cold, my brother and his bride were also invited, so we piled into their brand-new Mini and drove out into the wilds of Washington Country. 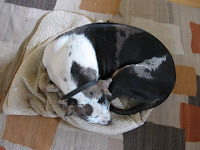 We turned off the two-lane highway onto not one but two dirt roads till we spotted the telltale pink Victorian farmhouse on the canyon's steep sides, and pulled up to be greeted by the lovely Clementine, their Catahoula Leopard Dog. 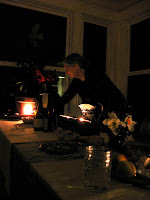 The tiny woodstove was cranking out the heat and the kitchen island was covered with incredible homemade appies prepared by Brian and another invitee, David Padberg of Park Kitchen. (Get what I mean about the karma-working-overtime thing?) 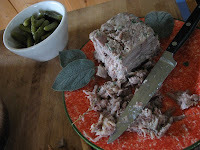 Included were...get this..fried and marinated smelt covered in sautéed onions and toasted pine nuts, a rabbit rillette, head cheese made from last summer's pig, and sides of crispy crostini, homemade mustard and tart cornichons. Where to start? Since Clare had suggested touring the farm during a break in a drenching downpour, I scarfed as much as I could grab, pulled on my wellies (I came prepared) and we set off to meet their chickens, cows, draft horses, pigs, goats and Edward, the guard llama. I was in heaven, of course, tromping up and down the steep hillsides and feeding the animals out of hand from the bucket of feed Clare had brought along. It was on the tour that the full extent of this talented young couple's skills came to light. Brian is (and I'm not laying it on hoping for an invitation back): a talented winemaker, farmer, expert gourmet-level cook, welder (he made most of the coops and animal shelters as well as the biggest steam-punk-style smoker I've ever seen, all of them on wheels), and millwright, felling trees and milling beams to shore up the barn that collapsed in last winter's snow. 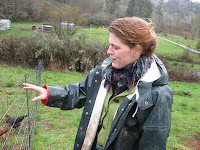 Clare is: a martial artist, plowhorse wrangler, farmer, painter and graphic designer, responsible for not only their wine labels but those of many other wineries. It made me tired just hearing about it! 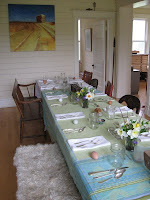 The tour over, we got back to find the eponymous Big Table in the dining room set with a beautiful collage of old silver, mason jars for water and an egg at each place that, when we sat down and read each one in turn, was a praise poem for spring. Then the food started coming, beginning with Brian's incredible homemade homemade ravioli stuffed with ricotta, caramelized onions and pine nuts with sage butter. Dinner, not only gorgeous but soooo good! As the dozen of us ate and laughed and drank some of the many bottles of wine that had been opened, Clare and Brian served up the main course of a luscious corned beef from Mossback Farm that had been brined for five days, a potato gratin from Amy Benson and Chris Roehm of Square Peg Farm (who were also there that evening) and farmers' market asparagus topped with Brian's rich garlic aioli. Good food, good meat, good God let's eat! Then came...are you still with me?...a warmed arugula, walnut and grilled onion salad with greens from Square Peg. And, as the evening grew dark and candles were lit, an assortment of cheeses for dessert, plus, obviously, more wine, much happy chatter and eventually a walk back our cars in the star-studded moonlight shepherded by the attentive Miss Clemmie. Lighting the Pascal tea lights. As I've said so often before, am I lucky or what? Haberdasher (ha-bə(r)- da-shər) noun, from Middle English haberdassher, from modification of Anglo-French hapertas, kind of cloth; 14th century. 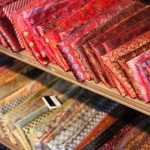 1: (British) a dealer in notions; 2: a dealer in men's clothing and accessories. Hilaire's. Huber's. Charles F. Berg. Henry Thiele's. John Helmer. Trader Vic's. All names that were recited with reverence by anyone familiar with downtown Portland in the last half of the 20th Century. And, except for Huber's and John Helmer, all gone. "If it were up to me, gloves would still be worn by women shopping downtown and gentlemen would wear hats. (Don’t men look more distinguished in a fedora, rather than a ball cap?) So when my husband decided a summer straw hat was one of his birthday wishes, we headed into the shop on the corner of SW Broadway and Salmon. Bartholomew Cubbins would have been right at home here, as hundreds of hats were lined on shelves and tables for our perusal. Usually I'm in my element in any store, but, though I was more than welcome here, it’s definitely a manly place. A rainbow of ties, buckets of very personable canes, men's clothing and men shopping for that perfect hat. I’ve never seen men vie for a mirror before, so that was a treat in itself. "A very dignified John Helmer, Jr., may wait on you, and completely brings to mind the British actor John Gielgud—such a gentleman, with a bit of a wink in his eye. The shop is rather like that, too. Very dignified, yet approachable." Details: John Helmer Haberdasher, 969 SW Broadway. Phone 503-223-4976. It's like seeing your child in a suit and tie. All of a sudden he's not your little boy any more, but a young (and quite handsome) young man. Even though he's had a beard since high school and is taller than his dad (who, at 6'4", presented quite a challenge), somehow I was never able to completely rid my brain of the picture of him as a kid. What does that have to do with the lacinato kale pictured above? The first time I made this kale salad, it gave me a whole new vision of what green salad could be. Heartier than a lettuce salad, not like the sautéed greens I've come to crave this past year, it's something new. The recipe's from my neighbor Susana, whose Asian Chicken Wings have been the hit of so many appetizer spreads. Thoroughly mixing the greens with the olive oil, lemon and salt ahead of time and letting them naturally wilt (called a "quick cure") still leaves the kale with a toothsome texture and somehow sweetens the flavor. This would be great with any barbecued meat, from chicken to pork, and could be livened up with chopped egg, toasted pine nuts or bacon bits. 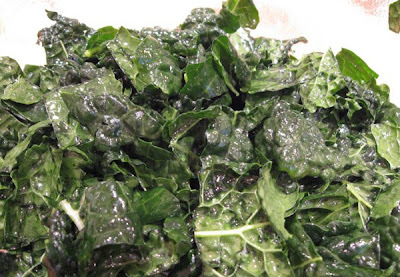 With knife, remove center veins from kale. 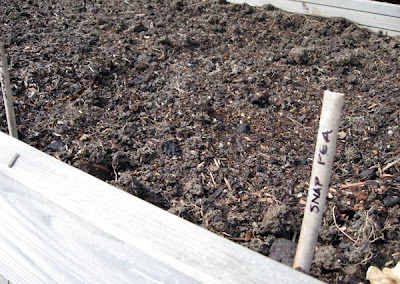 Stack several leaves together and slice into 1/2" strips and do the same with the rest of the leaves. Place in large salad bowl, add oil, lemon juice and salt. Using your hands, work the oil mixture into the leaves for at least a minute, then let sit on the counter for at least 20 minutes to cure. Adjust seasoning to taste and add any additional ingredients just before serving. "This summer, the Oregon Department of Agriculture will send out inspectors to scan every farmers' market in the state to help decide whether new rules are necessary to reduce potential health hazards to market-goers." Concern is building among farmers' market supporters, vendors and managers about recent rumblings over at the Oregon Dept. of Agriculture (ODA) indicating that they may be poised to impose new regulations based on what ODA Food Safety Manager Ellen Laymon refers to as "surveillance" exercises, according to a recent article in the Bend (OR) Bulletin titled "Fair Warning, Farmers Markets." You may remember that almost exactly two years ago, after the scare over e. coli-contaminated California spinach, the state ODA was moving to increase its authority over farmers’ markets by licensing farmers’ market associations as a class of "retail food establishments." 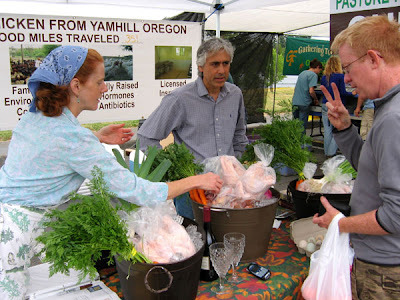 This time the ODA is taking a slightly different tack by clamping down on market vendors, even though, according to the article, "Laymon stressed the department has no evidence that there are unsafe practices in Oregon farmers markets. 'We can’t even link one illness to a farmers market purchase,' she said." As contributor Anthony Boutard of Ayers Creek Farm pointed out two years ago, "farmers’ markets are not a regulatory desert. Currently, all 'potentially hazardous' foods are sold by licensed vendors. These include meat, fish, processed foods, bakery goods and dairy products." In addition, customers, market managers and the farmer community have proven far more effective as regulators than a paper license and an inspector who shows up once a year. In a recent Oregonian article covering the peanut contamination, it was reported that ODA staff waited four days to alert people of potential problems: "Laymon said state officials learned late Friday that tanker trucks filled with potentially contaminated peanut butter had gone out across the country, but waited until Wednesday to call retailers because of the Martin Luther King Jr. holiday and the need for conference calls on Tuesday." What? A three-day weekend and conference calls got in the way of notifying the public about a potential public health emergency? I'm sorry, but if this is how the department prioritizes its time, it sounds like it has more important issues to deal with than sending out inspectors to check on weekend farmers' markets. To put it plainly, the increase in regulation the ODA is considering this time around wouldn't appreciably improve public safety over current regulations, but would further burden small farmers who operate on relatively low margins and tight schedules as it is. And, if the ODA's Laymon follows through and adopts the draconian measures she cites in other jurisdictions, you might not see any of your favorite purveyors of artisan meats, seafood or cheeses. 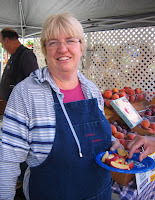 If you read the article and want to let someone know how important your farmers' market is to your family's health and well-being, you can e-mail Brian Clem, Chair of the House Agriculture and Natural Resources Committee; or Jackie Dingfelder, Chair of the Senate Environment and Natural Resources Committee, and ask them to keep watch over ODA's activities. For a list of your own state legislators and their e-mail addresses, click here. "There are two grades of this ham. 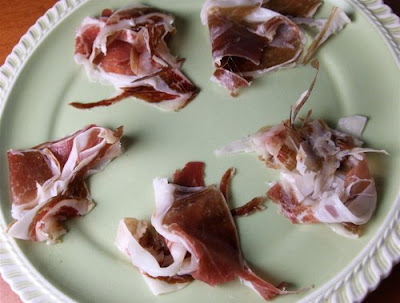 The Jamón Ibérico lives the life of a regular, grain-fed pig. The Jamón Ibérico de Bellota lives, sleeps, roams and forages under the open sky in specially maintained oak forests, called "la dehesa." The meat of either is superb, but the freedom, exercise and diet render the meat of the Bellota pigs as the ultimate expresson of this exquisitely silky ham." Details: Jamón Ibérico de Bellota from Foster & Dobbs, 2518 NE 15th Ave. Phone 503-284-1157. Oh, Jonny boy, what would do without ye? Who he had to bribe, I have no idea. Normally at the beginning of April we here in Portland are doing that in-like-a-lion thing, with the traditional rain, hail, thunderstorms and wait-ten-minutes-the-weather-will-change dance. But my friend Eamon "Shoehorn" Molloy (lower right), head dude of the Hillsdale, Lloyd, Multnomah and, temporarily, Interstate farmers' markets, had nothing but blue skies and temps in the 70s for his tables-on-the-front-lawn 50th birthday party. 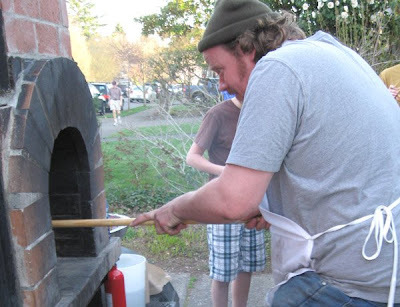 Which is a very good thing, because he'd asked Mark Doxtader of Tastebud (top photo) to haul his huge brick wood-fired oven over for some serious pizza-making. And there were platters of salads, one a particularly fabulous wheat berry and kale flower combination that totally rocked (and yes, I'm working on getting the recipe!). And I was forbidden from naming names or publishing pictures of the process, but certain fluffy, pastel-colored marshmallow treats got singed in a certain wood-fired oven, making them a crunchy-on-the-outside, marshmallowy soft-on-the-inside treat, a poor man's crème brûlée. Whatever it might be called, I declare it deeeelicious!